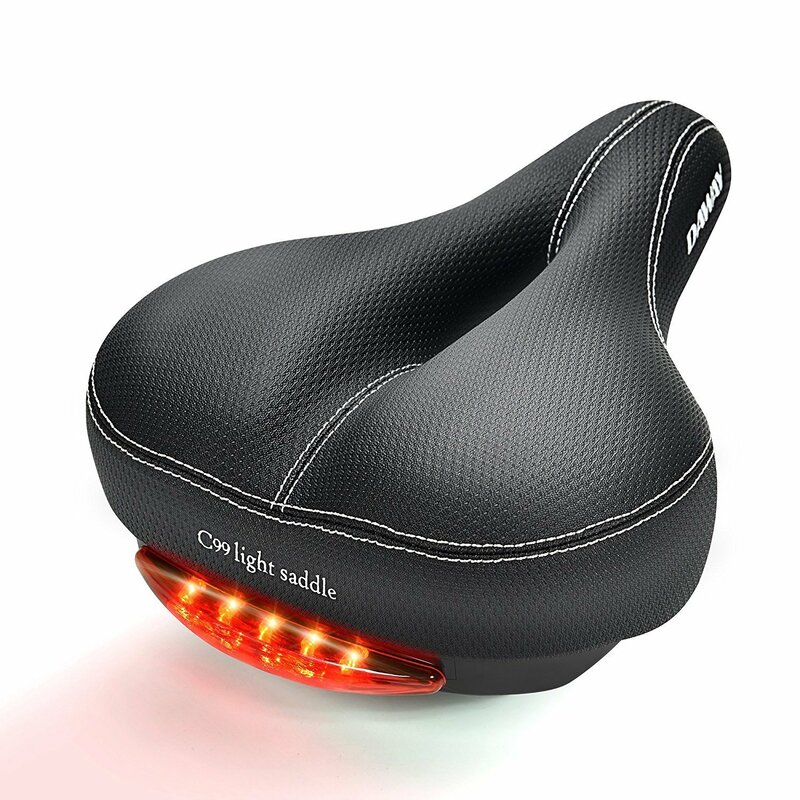 Men’s bike seat relieves pressure off your sensitive areas and supports your buttocks to reduce the pain and soreness generally caused due to cycling. 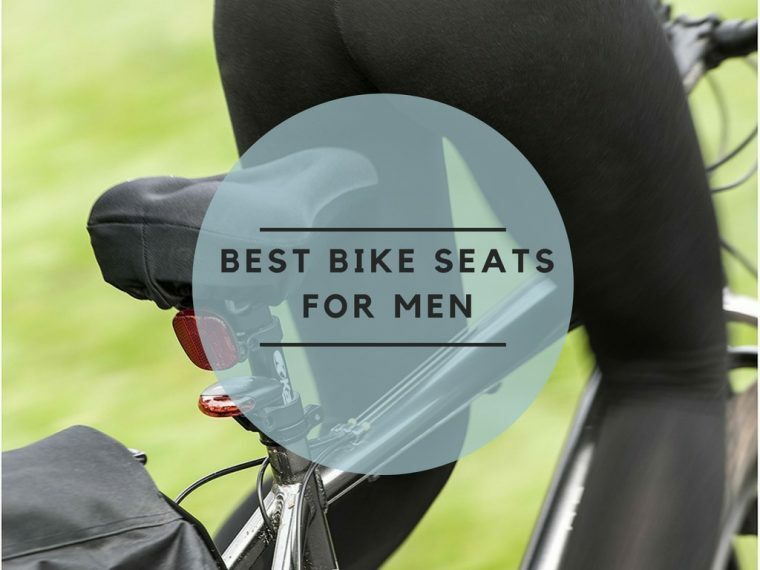 Best bike seats for men is the one that is well-cushioned, is of the right size and right shape. Such saddles will reduce pressure on soft tissues like your prostate and tailbone. Not just that, bike saddles for men are deliberately made to eliminate blood flow problems, prostate issues and to promote rider’s performance on the road. Men’s bicycle seats are generally narrower and longer than women’s saddles. Also, men’s seats have long and larger relief hole, manufactured by keeping their unique anatomy in mind. But with so many options in the market, which one’s the best for you? If there’s a bike saddle deliberately made for comfort riding, it would be this Sunlite Cloud-9 Bike Saddle. Famous for being one of the best bike seats for men, the Cloud-9 suspension cruiser saddle has a unique anatomic relief design that cushions your rear as you ride. Dual-density gel foam padding on the saddle is forgiving and ultra-soft, thereby adding to the comfort. Many of the gel-reinforced saddles today in the market make use of the liquid gel. So, when such gel solidifies, the saddle feels uncomfortable and hard. But Cloud-9 bike seat uses unique multi-stage gel design. What’s that? The outer side uses soft gel/foam, and the bottom features a layer of dense gel. Such unique design prevents the padding from bottoming out. Apart from its unique Gel Technology design, the Cloud-9 bicycle saddle also features an extra-thick and durable “Lycra” top. As a result, the top resists fading feels soft and is extremely comfortable. As for its generous size, it measures 10.5” in length and 10.5” in width. To smoothen out the impact caused by big bumps, chrome coil spring suspension on the inside of Cloud-9 absorbs shocks proficiently. If you are worried about its fit, then rest assured, as this saddle has a universal design made to fit any standard seat post. Customers found Cloud-9 to be extremely comfortable and wide enough to cushion big bottoms. The best thing about Cloud-9 is that it does not activate any pressure points. Seeing its price, myriads of users have found it ideal for leisure riding. That’s because, they feel it is very comfortable, yet firm at the same time. And, it also dramatically smoothens the impact of road bumps. Cloud-9 Sunlite is hands-down one of the best bike saddle for men, especially for those with big buttocks. It has wide seat and dual-density gel foam padding that’s forgiving and super soft. What makes it more appealing is the extremely affordable price tag. It is slightly heavy so that we won’t recommend it for racing, but it's the most comfortable bike saddle for your leisurely rides. Just like Cloud-9, Bikeroo offers yet another wide and extra-large bicycle seat, deliberately made for outdoor riding. By the looks of it, the chair in itself has thick padding that alleviates the soreness and pain caused by uncomfortable hard saddle. Made from high-quality faux leather, Bikeroo certainly does not fail to impress us with its longevity. Thick padding is not the only advantage up its sleeve. Bikeroo bike saddle also features dual spring suspension to absorb road shocks effectively. It also distributes the pressure equally across the bike seat, thereby preventing back pains. Overall, it measures 7” x 10.2” x 10.2”. Bikeroo has paid a significant amount of attention to provide their customers with useful accessories. This bike saddle comes with a waterproof saddle cover to protect the saddle when not in use, a universal bike seat adapter, mounting tools and mounting instructions. Plus, you also get an e-book filled with useful info regarding all the things that a biker must be aware of. Thanks to standard rail mount system and universal bicycle seat adapter, you will now be able to install this onto most bikes, especially road city bikes, mountain bikes, cruisers, touring bikes, etc. It’s amazing how customers were able to install Bikeroo saddle within just 2 minutes. Myriads of users have replaced their uncomfortable and small exercise bike seats with this Bikeroo seat and found it to be extremely comfortable. According to the customers, it's thick padding, wideness, and dual spring suspension are the most prominent features. Users claim that it proficiently smoothens out shocks caused by bad road conditions. And, many think that it is one of the best bike seats for males with large posterior. If you fancy stiff and full bike saddle with thick padding, Bikeroo bicycle saddle is just the right choice for you! But if you want a bike seat that’s soft, this one might be a disappointment. As for its spring suspension, it performs amazingly well in absorbing vibrations caused by bumps. The best thing here is that Bikeroo provides you with all the essential accessories at a reasonable price. 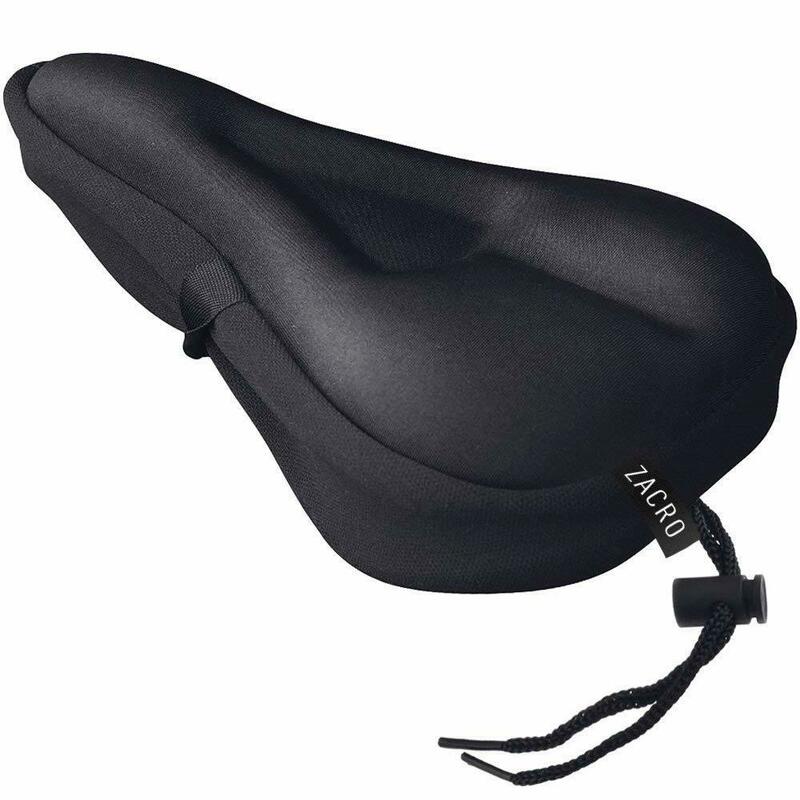 This bike cushion from Zacro is ergonomically designed to provide utmost comfort to all types of riders out there. Unique relief design of Zacro Gel bike seat eliminates pressure points on sensitive organs for your optimal comfort. It might be wrong to call it a bicycle seat; instead it’s a bike seat cushion that goes onto your bike’s original saddle to make it more soft and comfy. Extra soft gel padding on the inside offers excellent cushioning to make your long trips enjoyable. Unlike other saddles that are challenging to mount, this one fits easily onto most of the bikes. The dimension of the seat cushion is about 11” x 8”. So, if your bike’s original saddle is within this range, this cushion will fit onto it perfectly. But, if your bike seat is wider than this, you might want to look elsewhere. As you can see in the images, Zacro provides an adjustable drawstring which locks the cushion in place. You can effortlessly install the cushion tightly over the seat and then adjust it as per your convenience. As a bonus, Zacro also includes dust/water resistant cover along with the product. When you lock the bicycle, you can cover the seat to protect it from weather elements. Many users rave about how quick it is to install Zacro Gel cushion onto your original saddle. All you need to do is slide it on and lock it with the drawstring. The gel padding is not very comfy as in high-end saddles, but it relieves seat pain altogether, says, users. Some users claim that it moves or tends to fall off the seat. But all in all, it is a great cushion to make your rides more comfortable. If low price is what you seek, Zacro Gel Bike saddle is the cheapest one in this review. But that doesn’t mean it sells out its quality. This bike seat is made from a durable fabric top and comes with water/dust-resistant artificial leather cover as well. For such a low price, it is quite comfortable and optimal for recreational biking. Looking for a wide seat with a center cut-out to ease the pressure from sensitive areas? Here’s your ideal option- DAWAY bicycle saddle. It probably is the different bike seat amongst all the other saddles mentioned here, given its colorful tail light! DAWAY C99 bike seat features thick and soft high-density memory foam padding which significantly comforts your hips. Whereas, the surface is made from anti-slip, wear-resistant and textured PVC leather. These premium materials altogether take the comfort level of this seat to a whole new level. On the whole, DAWAY cushion measures 11” in length, 8.7” in width and 3.5” in height. If you’re wondering what makes this stand out from all the other bike seats, it is its eye-catchy tail light! Uniquely designed waterproof tail light is equipped with 5 bright LEDs which are powered by 1 CR2032 battery. Use your discretion to choose between 3 lighting modes and get ideal visibility for safe cycling during night-time bike rides. As regards to its shock-absorption ability, DAWAY’s bottom is integrated with dual spring rubber ball suspension for your protection on bumpy roads. In like manner, its hollow design offers forgiveness and enhances breathability of the seat. Boasting a universal design, DAWAY C-99 comes all-included with a bike seat rail clamp. Meaning, it can be mounted on any standard seat posts with no clamp on top, dual-track or clamp tube! The idea of built-in tail light in DAWAY C-99 has managed to impress several customers. Another thing that’s unique about this seat is its cut-out design made to provide relief to the sensitive areas, say, users. All in all, users found DAWAY seat to be well-made, easy to install and fairly comfortable. On the downside, many customers think that it is not as soft as advertised. The memory foam is supposed to be soft and retain an indentation when compressed, but it's quite the opposite with this seat, according to the users. If you love the idea of having an inbuilt tail light in your seat for safe night rides, this DAWAY bike seat will appeal to you! 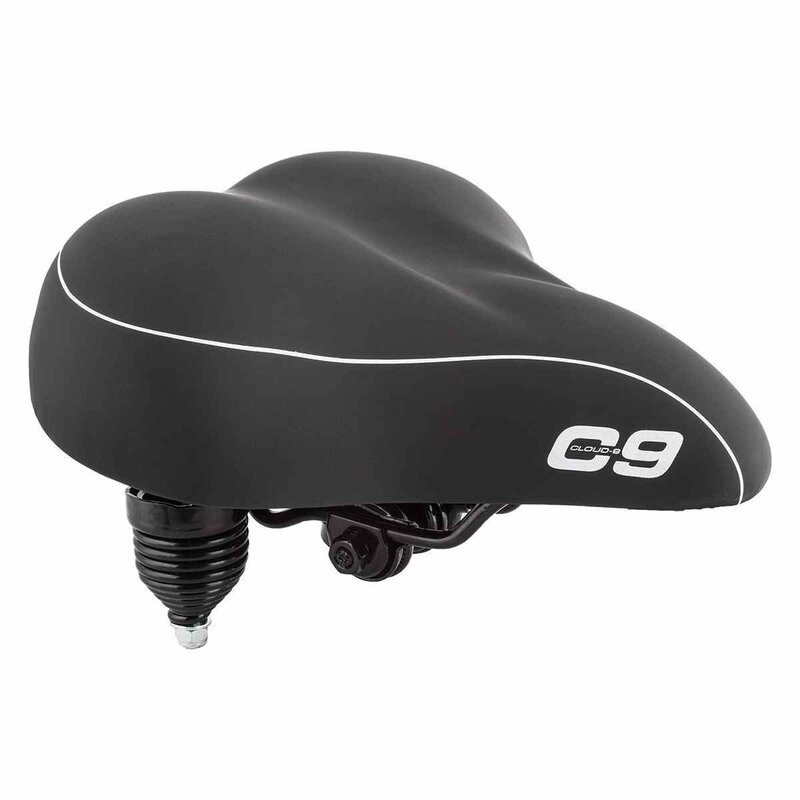 DAWAY C-99 is best bicycle saddle for men seeking a cut-out relief design in a wide seat. For those of you who don’t know, Bikeroo is a family-owned small business that has a strong passion for producing good-quality affordable cycling accessories. One such affordable bike accessory has to be this Bikeroo padded Men’s bike seat. If you are looking for a narrow bicycle saddle with cut-out relief design, this one’s made for you! This anatomically supportive bike seat evenly distributes pressure across the surface of the seat, thereby alleviating sit bone pain. 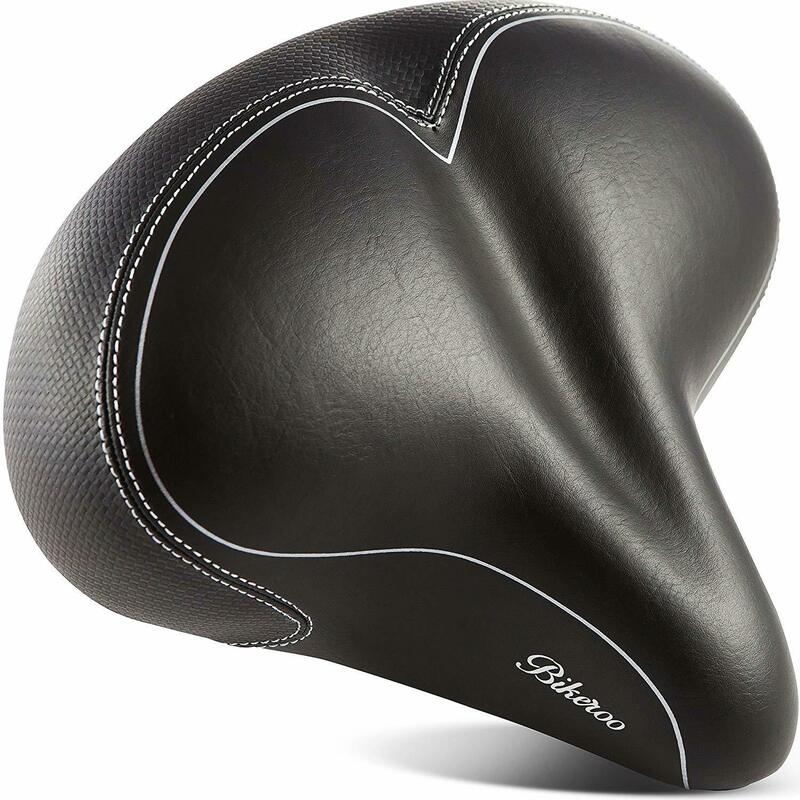 Uniquely designed by keeping men’s anatomy in mind, this Bikeroo bike saddle features a deep center cut-out and outline to offer forgiveness and relief. Ideal soft padding on this ergonomic seat relieves pressure points of your sensitive areas so that you can pedal longer without any pain. Bikeroo Narrow bike seat’s top surface is made from artificial leather, inside features high-quality foam padding and mount system has stainless-steel rails. You can use it as a mountain bicycle saddle, road bicycle saddle or even onto stationary exercise bikes. Everything you need for proper installation of bike seat is included in the package- a seat adapter, video mounting instructions, mounting tools, an informative eBook and a free rain cover. Several users have found this Bikeroo seat to be an anatomical seat specially designed for men. Many claims that it effectively provides relief from saddle soreness. Some users also say that it is comfortable for leisurely bike rides, but the seat is not narrow enough for racing or training. According to a customer’s view, this seat might not be comfortable for all body structures. Some might find it pleasant; others might feel discomfort at sensitive areas. If narrow seat, stiff foam padding, and a deep cut-out design are what you are looking for in a bicycle saddle, go for this one from Bikeroo. It is designed by significantly considering men’s anatomy and accordingly designed to provide comfort. Seeing its price, you will not be disappointed with its quality and performance. Bicycle seats come in varieties of sizes and shapes to befit different types of riding styles, be it commuting, touring, racing or leisure cycling. With so many options in the market, know that there’s a seat made to suit every bum. You have to know where to start and how to choose your best bicycle saddle. We all know uncomfortable bicycle seats can cause serious health issues, so much so that it may cause chronic pain, especially in men. bicycle seats are linked to prostate problems, erectile dysfunction, soreness and even skin irritation. To solve this dilemma, it is highly recommended to invest in a bicycle saddle that’s deliberately manufactured by keeping a man’s anatomy in mind. 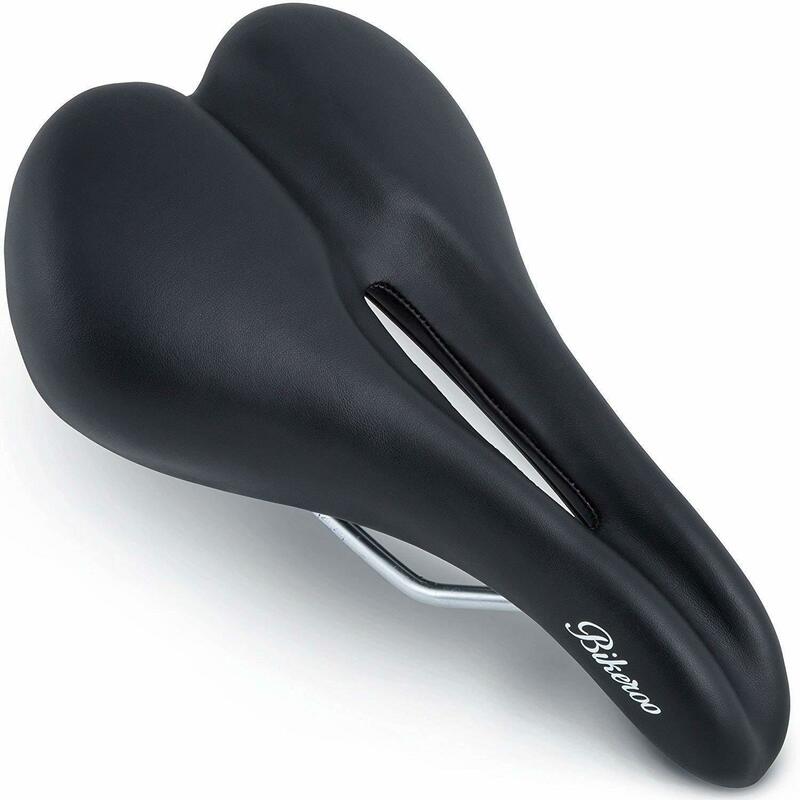 A good bicycle saddle is the one that supports your sit bones and not your entire buttocks. If your riding position is deep/stretched out and you tend to ride faster, look for a narrow cushion with minimal padding. That’s because, when you stretch out, you impose less weight on the bike seat. If your riding position is upright and you tend to ride slow, look for a wider cushion. That’s because, when you sit upright, it needs to support your weight effectively. Abiding by this logic, performance bikes have thin seats, and recreational/comfort bikes have wider seats. V-Shape: Recreational bikes such as cruiser, commuter or urban bikes typically have v-shaped cushioned with a short nose, a pronounced seating area, and springs. T-shape: T-shaped bike seats are generally found on mountain bikes. Since riders sometimes stand up on pedals or lean forward during aggressive climbs, such t-shaped outline and a fair amount of padding on sit bones provide good support. Very thin T-shape: Performance bikes (racing) feature extremely thin T-shaped seat with long and narrow nose to suit racer’s riding position. A bike saddle that is too wide might cause chafing. A bike saddle that is too narrow might feel too sharp on your pelvic area. It's a misconception that more padding provides extra comfort. If such were the case, all racers and professionals would use thick padded seats. In reality, padding creates more contact and deforms. Which is why such seats feel very uncomfortable during long rides. Thick and soft padding tends to squish after repeated use. It will then compress down under sit bones, and the nose might elevate, thereby creating pressure points. The shape of the seat is much more important than its padding. Racing bike seats generally come with less padding to save weight, which is much desirable for racers. Commuting and Recreational bike seats have thick and soft foam padding or added gel for comfortable cycling experience and better cushioning. Strategically placed gel inserts can be comforting in such saddles. All-leather seats or Performance seats are ideal for long-distance touring. Such places fall between a road saddle and a mountain saddle. It has a long and narrow nose with good sit-bone cushioning. If you are an occasional rider, look for a bike seat with extra padding to prevent your hip bones from paining. But for long hours of cycling, an extra-padded bike seat can feel painful, pinch or chafe your sit bones and cut off blood circulation. When you are cycling day by day, you need incredibly comfortable seats. So, in such situation, many riders prefer leather saddles as they are comfortable as well as durable than synthetic foam-padded seats. Hence, you need to choose the right amount of padding as per your riding style. Do you need a cut-out design? Most of the riders prefer a bike saddle with a relief cut-out or a center hole that alleviates pressure off sensitive areas while riding. Although, rider’s natural pelvic tilt and their flexibility are equally significant. Keep in mind that cut-outs and channels are not suitable for everyone. Every rider’s anatomy is different, some riders find it comfortable, and others see it as undesirable. You will notice that many professionals don't even use channeled seats, even when they ride for thousands of kilometers. It's just the matter of comfort and personal preference. If you have prostate problems or urological issues, you might want to look for a saddle with a cut-out relief design. Or when you always feel uncomfortable on bikes, even when its padding and shape is good, what you need is a cut-out design! Price of the bike seats is mainly determined by the quality of materials used for its manufacturing. Cheap saddle will make use of steel alloy rails. Moderately priced bike saddles use titanium or manganese rails. Whereas, high-end models will use carbon for their rails. Carbon rails are light in weight- which is why they are super-expensive. Entry-level bike seat models will feature steel rails and plastic/nylon or fiber-reinforced polymer bases. Whereas, top end models use entirely molded carbon fiber bases along with carbon rails. Higher the price, lighter will be the materials used. So, if lightweight of the bike seat is your top priority, then you must be willing to spend more. If comfort is what you seek, you can give preference to titanium rails over carbon rails. Because hollow titanium rails provide extra flex that promotes shock-absorption on roads. The base of the saddle needs to have additional flex so that the seat can smoothly deform upon impacts caused by road bumps. Gel Cushioning provides plush comfort and conforms to the shape of your body. Most of the comfort riders prefer such padding for greater comfort. The only downside is that gel can compress more quickly than foam. Foam padding, when compressed, retains the indentation and then springs back to its original shape. Road riders prefer such padding because of its greater support as compared to gel. Soft foam is recommended for occasional or short-distance rides. Whereas, the stiff foam is preferred for long rides and riders with big sit bones. Q. When to replace your bike seat? A bike saddle can be expensive, but with proper care, it can last you decades. Remember, you get what you pay for. An affordable saddle might include cheaper synthetic leather, foam or gel padding, which wear out quickly as compared to high-end models. When your saddle was comfy and supportive but has recently stopped doing its job, know that it is time to replace it. Q. What is the difference between men’s bike seat and women’s bike seat? Women’s saddles are wider at sit-bones areas and somewhat shorter in length. Also, padded areas are different in women’s and men’s saddles. Q. Are leather saddles better than other saddles? Leather saddles are long-lasting, equally comfortable and promote breathability way better than other seats. Now that you know the significance of comfortable bike saddles uses your discretion to pick your ideal one from the reviewed bike seat for men. If you continuously feel uneasy on your current bike seat, even after short rides, know that you need to replace it with a bike saddle that fits you right! With or without cut-out relief design, the choice is yours. Just make sure you choose the one that is by your body’s shape and size. Considering all key features, we think Sunlite Cloud-9 is one the best one. It is a cruiser bike seat designed for rider’s utmost comfort. What makes it the best, you may ask? It has unique anatomic relief design and an extra-large seating area. But what makes it stand out from the others is its dual-density gel-foam padding that’s equally soft and supportive, a little different than what we usually see in bike saddles. Our mission in The Elite Product to help you with clarity and confidence in solving your problems and find what you look for from product/gadget to how-to. Part of The Elite Media Group. Copyright 2016 - 2018 by The Elite Product.